The concentric circles of which the structure is composed is clearly revealed by satellite imagery. However, these characteristics are not visible when walking across the structure. The consensus today is that the structure is a natural geological feature. It did not take long before it was being compared to Plato’s description of Atlantis. However, Ulf Richter has pointed out that it is too wide (35 km), too elevated (400 metres) and too far from the sea (500 km) to be seriously considered as the location of Atlantis. Nevertheless, researchers such as Robert deMelo are still prepared consider it a possible location candidate(b) . 50 km west-southwest of Richat is a similar though smaller feature, the Semsiyat Dome, having a diameter of just 5 km. 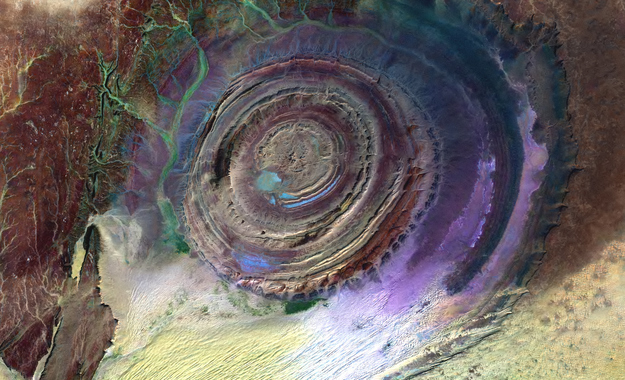 In 2008, George Sarantitis put forward the idea that the Richat Structure was the location of Atlantis, supporting his contention with an intensive reappraisal of the translation of Plato’s text(g). His theory has been published in Greek, with an English translation now (2017) imminent. In 2006 George S. Alexander and Natalis Rosen were struck bythe similarity of the Richat feature with Plato’s description and decided to investigate on the ground. Instability in the region prevented this until late 2008 when they visited the site, gathering material for a movie. The film was then finalised and published on their then newly established website in 2010(c). In 2013 further support for linking Atlantis with Richat came from Jose D.C. Hernandez with a rather convoluted theory in a paper entitled A Celestial Impact and Atlantis(f). Towards the end of the 2018 media ‘silly season’, the YouTube channel Bright Insight made a pathetic attempt to breathe new life into the Atlantis in Sahara theory. However, it fails on one simple fact; it is not submerged, but for good measure, when Alexander and Rosen investigated the Richat Structure they could not produce a single piece of physical evidence from the 35 km wide site. Where was the bustling port described by Plato. I could go on, but remember, its not called the silly season without reason. In Joining the Dots  and in Atlantipedia.ie I have consistently argued that proximity is an essential logistical requirement in order to achieve a successful invasion. This was particularly true in ancient times when all empires expanded through the invasion of neighbouring territories. The Richat Structure is many thousands of kilometers from Athens, so to suggest that an attack was launched from Mauretania on Greece is simply ludicrous. Not unexpectedly, Jason Colavito has a few thoughts to add on this latest Atlantis in Sahara kerfuffle(h).